In the future, gung-ho young people go to another planet to battle giant bugs that are threatening Earth. 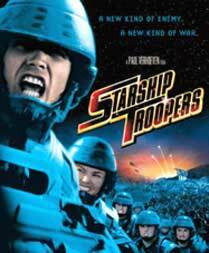 Intergalactic war, special effects, and wide spread gore make for an interesting sci-fi action thriller. The cast includes: Casper Van Dien, Dina Meyer, Denise Richards, Jake Busey, Neil Patrick Harris, Clancy Brown, Michael Ironside.